A marine biologist is engulfed by a school of barracuda and jacks as she conducts reef surveys in Kimbe Bay, Papua New Guinea. 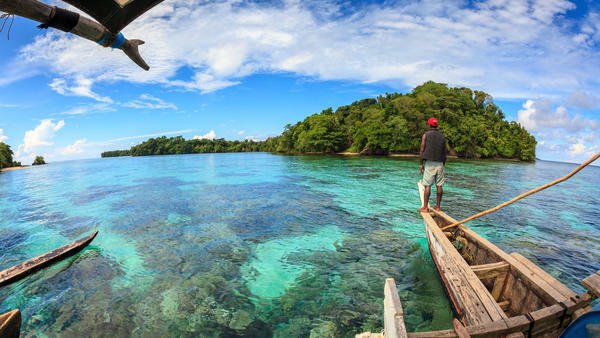 A fisherman surveys the shallow coral reef near a small island in Papua New Guinea. Some of the reefs around these islands are surprisingly healthy as a result of active fishery management by local people. This is what passes for good news about coral reefs these days: Around the world, some reefs aren't dying as quickly as scientists thought they would. A newly published study in Nature identifies 15 places in the Pacific and Indian oceans where fish populations in coral reefs are doing better than ecological models predict they should be. Around the world, warm oceans and human interference are still causing massive reef "bleaching" — when coral organisms stop feeding themselves and turn ghostly white. In fact, an Australian survey earlier this year found that the Great Barrier Reef is suffering "the worst mass bleaching event in its history." So what's different about these 15 healthier-than-expected coral reefs, and the fish that live on them? 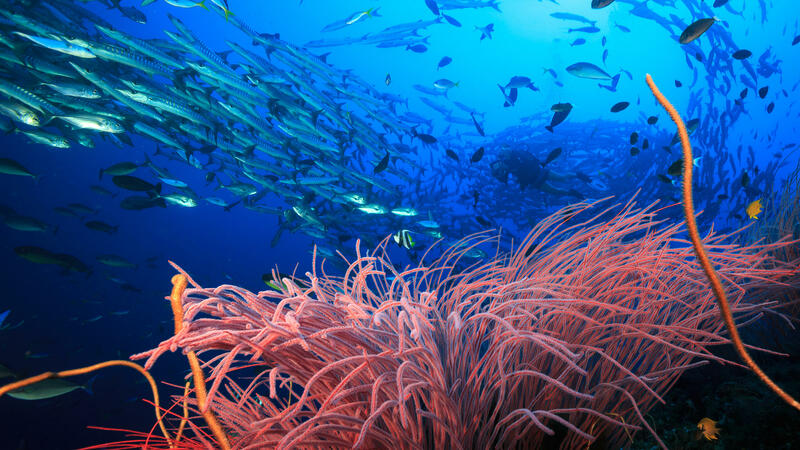 The new study found a few similarities between the 15 "bright spots," as the authors call them, among more than 2,500 reefs studied in 46 nations. Most of those similarities involve how humans manage their contact with reefs. Communities near bright spots include local people who fish on the reef in discussions about how to manage it, according to the study. They also have enforceable plans for managing the reef, often with local fishermen acting as the enforcers of the policy. Such measures prevent overfishing more effectively than top-down policies enforced by people from outside the community. Joshua Cinner, an ecologist at the University of Queensland in Australia who led the study, tells the Nature Podcast that "quite often the coral reef crisis is a crisis of governance." Although saving coral reefs on a grand scale will ultimately require that humans reduce carbon levels in the atmosphere — ocean acidity and warming are caused by high levels of atmospheric carbon — Cinner and his colleagues say these bright spots show that better fishing policies can lessen some of the damage. "If you want to manage a fishery, you'll have a very difficult time telling the fish what to do," he says. "It's the people you have to manage." Karkar Island in Papua New Guinea, for example, maintains its reef in part by closing off areas ahead of big social events to let the fish population build up before a big feast. The island also shares a physical similarity with many other bright spots — it is close to deep water, which ecologists think might be a refuge for corals and fish trying to avoid fishing disturbances. All of this might suggest that less human contact could boost coral survival rates in today's oceans. But the study finds this isn't necessarily the case. Counterintuitively, the researchers identified 35 "dark spots" — where fish populations are doing worse than expected — in parts of the ocean far from people. The study notes that these dark spots, which hug the equator and are spread around the Pacific, Indian and Atlantic oceans, "even include some remote, uninhabited locations often considered near pristine" — such as parts of the Hawaiian Islands that have been considered examples of well-protected reefs, but that ecological models show are actually less healthy than they should be. One of the reasons may be that ocean temperatures are rising globally, so even seemingly untouched habitats are too hot for coral to handle. It's a reminder that while effective fishery management might slow coral reef death, the underlying climate issues, which only compound the effects of weather patterns such as this year's El Niño, can't be so easily fixed.